RAKS SHARKI, translated literally from Arabic, means, “dance of the Orient”. Europeans traveling to the Orient in the 19th century dubbed the dance “danse du ventre”, or “belly dance”, in reference to the unaccustomed movements of the torso and pelvis which were nonexistent in European dances. This is a misnomer, however, as Oriental dance uses the whole body, including movements of the head, shoulders, arms and hands, with hip movements being far more predominant than isolated movements of the midriff. Oriental Dance is one of the world’s oldest dance forms, combining elements from different countries throughout the Middle East and North Africa. Although the dance exists in various forms throughout the Orient, it is in Egypt that RAKS SHARKI has most thrived and developed in recent times. RAKS SHARKI is an art form appreciated (and enjoyed) by both sexes, by both young and old alike. It is an integral part of the culture. In Egypt, no marriage or important celebration would be complete without a performance of RAKS SHARKI. Almost all Egyptian women can dance, having learned as children, not in dance classes, but at home and at family gatherings. Few women, however, dance for a living, as the reputation of a professional dancer is suspect in traditional Muslim Society. Centuries ago, dancers, musicians and singers were primarily of the slave class. Although this status later changed, performers have never totally escaped the stigma attached to their profession. In the modern age of mass media, however, films, recordings, radio, television, and performances in nightclubs and concerts have enabled certain performers to become well-known and wealthy, thus changing their position in society somewhat. The leading dancers of the 20th century Egypt have achieved celebrity status. A hundred years ago, it was common for an Egyptian dancer to perform with a small group of musicians, who were quite often related to her. The group was composed of perhaps a nay (flute), oud (lute), kanoon (zither), and riq (tambourine) or tabla (drum). 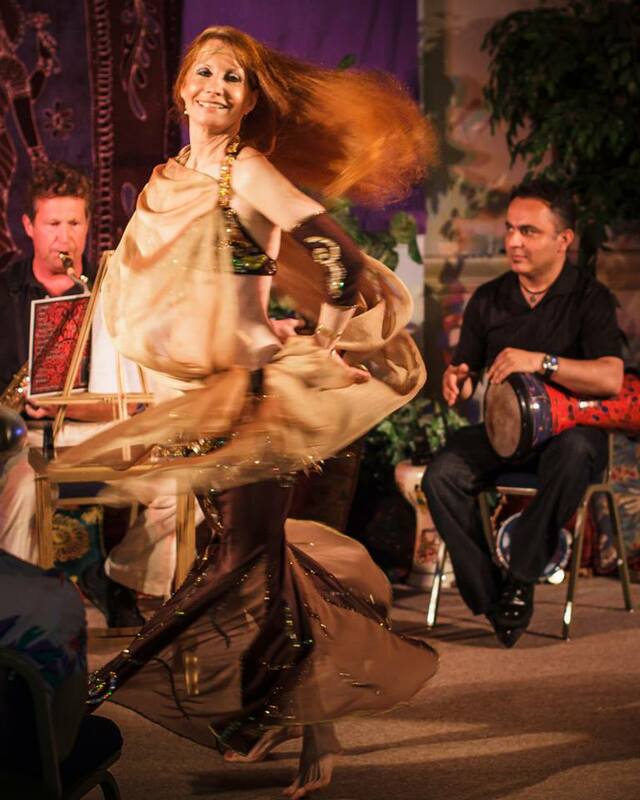 In case of the GHAWAZEE, the Gypsy dancers of Egypt, the group perhaps included a rababa (2-stringed fiddle), mizmar (oboe), arghul (double clarinet), souffara (a small flute) and tabla. The dancing was usually improvised. In contrast, the “star” dancer of today performs with a large orchestra (30 musicians or more) which plays modern electronic instruments in addition to traditional ones. Music is composed especially for her or well-known songs are especially arranged, with the rhythms changed to suit the RAKS SHARKI. Costumes are individually designed for her, and often her entire show has been choreographed. The nightclubs in which she dances are not disreputable cabarets, but exclusive clubs in respectable 5-star Cairo hotels, where the top performers of the Middle East appear.